We know sometimes it's hard to find a media storage cabinet that looks good AND organizes all those pesky electronic consoles and cords! So, that's why we've rounded up a few photos of our customers' spaces to give you some modern media inspiration for your home. 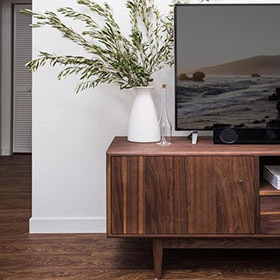 With solid wood turned legs and beveled edges, the Grove media cabinet in walnut is the perfect addition to @jchongstudio's dreamy space. 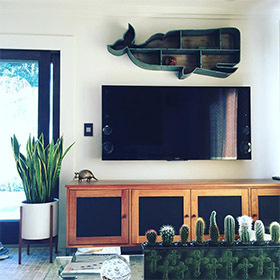 Made of natural steel, the Slim media console is a Room & Board classic and simply stunning in @Candy's home. 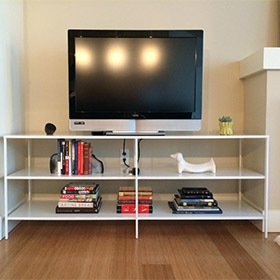 This Linear media cabinet in cherry provides enough storage and brings a lovely warmth into @bittobot's living room. 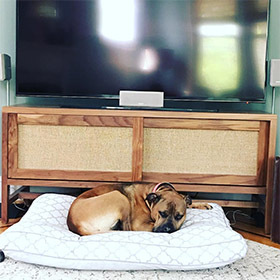 Our Berkeley media cabinet is a show-stopper (and perfectly matches the pup) in @little_ape's living room. 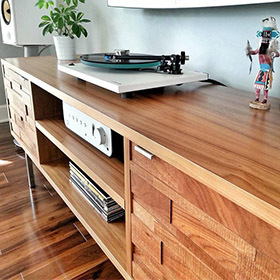 @xevelosx added character and texture to her space with the Innes media cabinet in cherry. Seeking more real-life modern design inspiration? Check out your fellow Room & Board fans’ home selfies in our Customer Photo Gallery (or get in touch with our Design Associates for free design services)!